Citation: C N Trueman "Fighter Command"
Fighter Command was established in July 1936 under the command of Sir Hugh Dowding. During World War Two, Fighter Command’s finest hour was in the Battle of Britain. From 1936 on, tension in Europe grew as Hitler became more expansionist. This led to the RAF reorganising itself and Fighter Command, as a specific entity within the RAF, was established with its headquarters at Bentley Priory, at Stanmore, Middlesex. The other components of the RAF were Bomber Command and Coastal Command. Fighter Command was organised into a number of groups, each of which was responsible for a specific geographical area of Britain. 10 Group covered Wales and the south-west of England. It was commanded by Air Vice-Marshall Sir Quintin Brand. 11 Group covered London and the south-east and did great deal of the fighting in the famous battle. 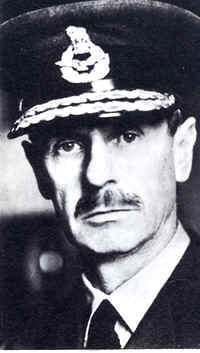 11 Group was commanded by Air Vice-Marshall Keith Park. 13 Group covered parts of northern England not covered by 12 Group and southern Scotland and Northern Ireland. It was commanded by Air Vice-Marshall Richard Saul. Each group itself was subdivided in an effort to make it easier to have tactical control. These subdivisions were called sectors and each one had a main fighter air base and a number of other satellite fighter bases attached to it. Each main fighter base had an operations room with maintenance and repair facilities for the planes attached to its sector. At the heart of each sector and group was Bentley Priory. Information on incoming German attacks received from the Royal Observer Corps and radar stations was sent to Bentley Priory. The commanders there decided on what group to involve and once activated, the group commander would then have control of his geographic sector and would decide on which sectors to use.